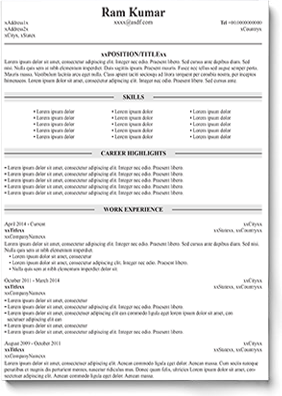 Writing a resume is just like drafting a marketing or sales pitch. If your sales pitch is not enticing and promising enough, you will not get many customers for your business. Likewise, if your resume fails to impress your recruiters, chances are high that most of them would dump your resume into their bin. When it comes to creating a powerful and impressive resume, you have to focus on a lot of aspects. 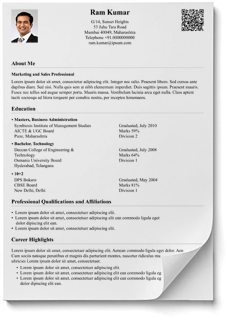 The format or style of your resume is one such attribute that cannot be ignored at all. When there are already like dozens of resumes in the competition, your resume definitely needs something extra to win the race. So, before you start working on your resume, let us highlight the importance elements that every power-packed resume format has. The top section of your resume should clearly showcase your full name along with complete address. Plus, for contacts you can list your email id and phone number too. Most importantly, do not forget to write your name completely in capital letters, and also make sure to bold it. 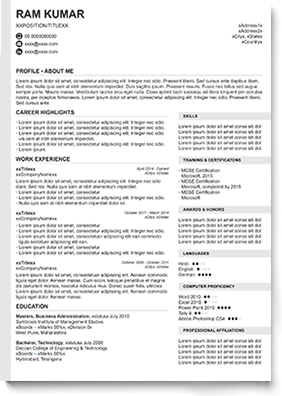 Choosing a resume format that instantly highlights your core strength areas is absolutely vital. Recruiters hardly spend more than 7 to 8 seconds on skimming a resume. So, in those few seconds if the recruiter is unable to figure out your core strengths, you know where your resume is going to land into- ‘the bin!’ In order to highlight this section, you need to make use of industry keywords. Plus, you can also jot down certain skills-sets that are related to your job or industry. In short, it can be said that this section is like a high-level summary of your educational qualifications as well as industry knowledge. When a wise customer spends his/her money on a product or service, he/she places a lot of thought behind. He/she won’t buy the item if it does not serve any value to him/her. Likewise, if you are not able to make your recruiter convinced that you can be a valuable employee to the company, he/she would not recruit you. So, through this section, you have to state what values or benefits you bring to the job. The objective section of your resume should provide an answer to every recruiter’s question- why should we hire you? Unless you are a fresher, it is very important to clearly mention the vital elements of your job experience. Do not forget to mention the role you are playing in your current job. Highlighting your core responsibilities will provide more idea to the recruiter about your experience. If you are a fresher, the details of your educational qualification will be your ‘selling points’. Hence, make sure you clearly mention your schooling details, college/university you have attended, and other major certifications. Do not forget to mention the dates too. So, those were the five major areas of any resume format that hold great importance. 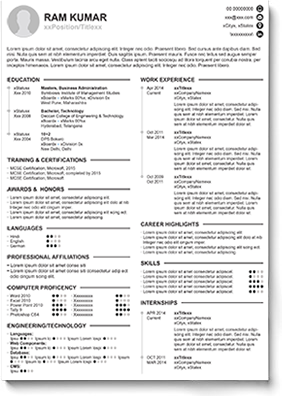 Now, let us know a little about the different types of resume formats you can choose from. 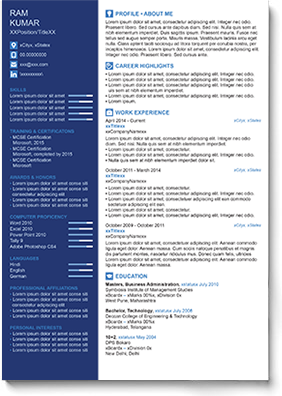 If you are not looking for a fancy format based resume then the traditional format is the one for you. If you are applying for a job in a conservative sector like finance, you can certainly go with the traditional style. 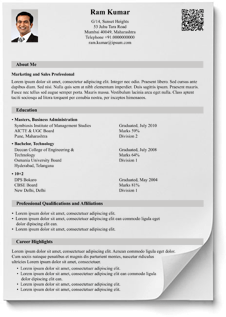 In this regard, one page resume can be an excellent option for you. The traditional format contains information in a very crisp and precise manner. 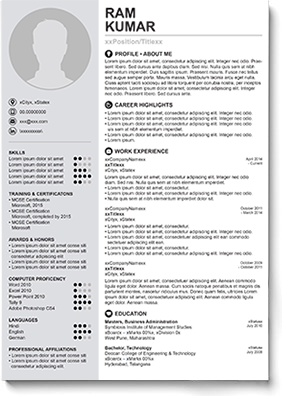 If you are more into clean and minimalistic format then you should go with the simple resume format. 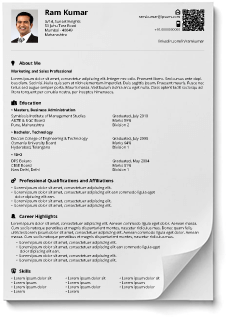 This kind of resume is more apt if you are applying for a job in the government or public sector. 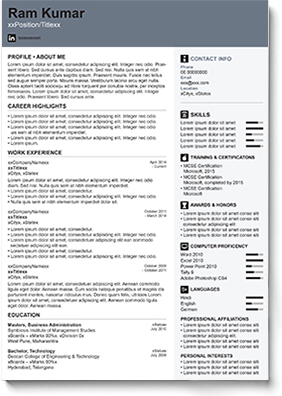 Rather than using fancy fonts and other distracting elements, you can come up with a clean look for your resume. As a matter of fact, sans-serif fonts are the most suitable option here. In case you are planning to apply for a senior or executive level position then picking the executive format can be more useful. 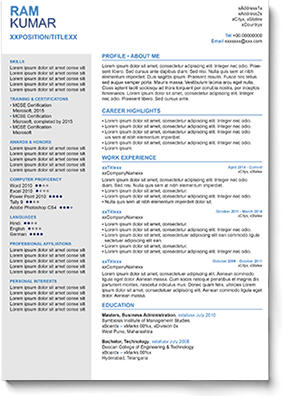 For an execute resume, the two page resume format would be more appropriate. After all, a job candidate applying for executive level position will certainly have good amount of work experience, and his/her resume must reflect the same. In today’s times, your resumes is more than your contact details, educational details, job experience, and hobbies. 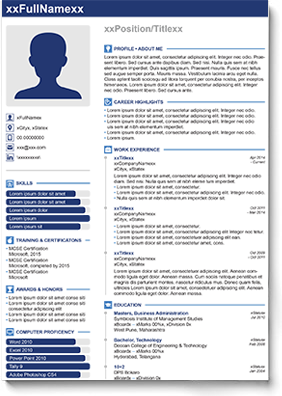 If you want to make your resume work in the modern world then you have to get it digitalized. In this regard, you have to optimize keywords in the right way. 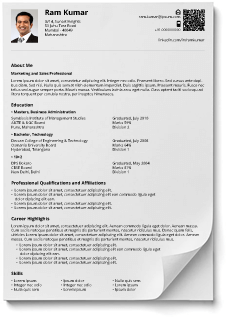 Your resume should also contain links related to your LinkedIn account and other such professional sites. 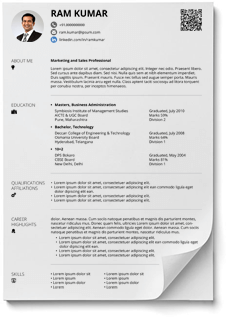 If you want your resume to focus more on your prior jobs and the related responsibilities, you should probably opt for this resume format. 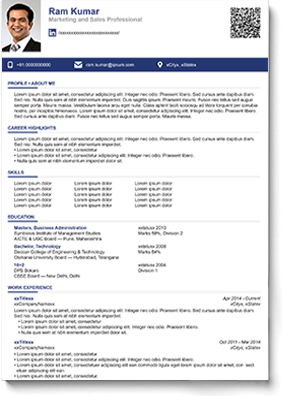 Apart from being a reverse-chronological resume, this type of resume also highlights on ‘what you can do’ for the company. 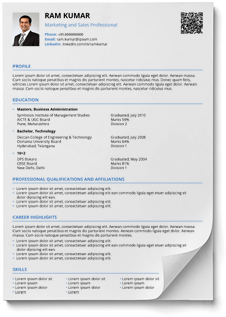 So, providing precise and to-the-point information to the recruiters is one of the main purposes of this resume format. 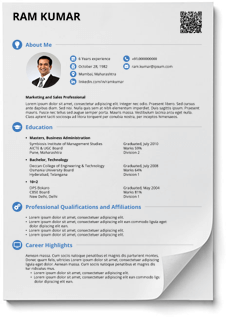 In addition to them, you may come across other formats too, such as Portfolio resume format, Video resume format, Infographic resume format, Creative resume format, etc. If you are not feeling confident about which one to choose for your needs, it is better to avail the services provided by the professional resume writing agencies. They have experienced professionals who know how to select the most appropriate resume style as per the nature of the job, candidate’s profile, and other vital parameters. When you avail the services of an experienced and reliable resume writer, you can surely expect good quality work in return. 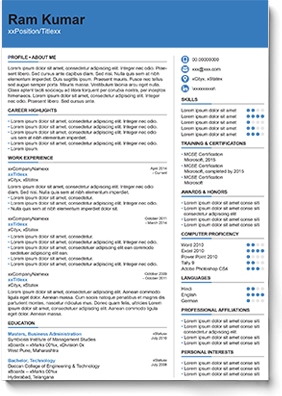 It will be their onus to choose the most suitable format, font, and length for your resume. So, what are you waiting for? 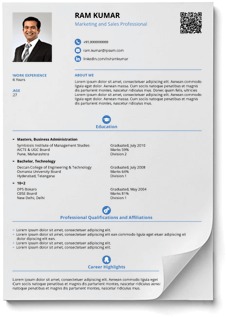 Get in touch with a professional resume writing company right now and get your resume designed in just a couple of days.